1. Remove the stones in the dates and soak in water with the honey and cinnamon for about 20 minutes. 2. Blitz the soaked dates in a food processor until they form a paste. 3. Add the peanut butter and blend until combined then do the same with the coconut oil. 4. Divide the mixture into small pieces using a teaspoon and place on a sheet of tin foil until all of the mixture has been used. It will be quite soft at this point but don’t be alarmed, you can roll it into balls when it’s had some time in the freezer. Freeze for around 20 minutes. 5. Once the mixture has cooled a little, roll into balls and freeze for another 30 minutes. 6. Melt the chocolate in a saucepan over a low heat then add in a little salt. You can do this in a glass bowl over simmering water but it’s a hass and you’ll only have more to wash up later. 7. 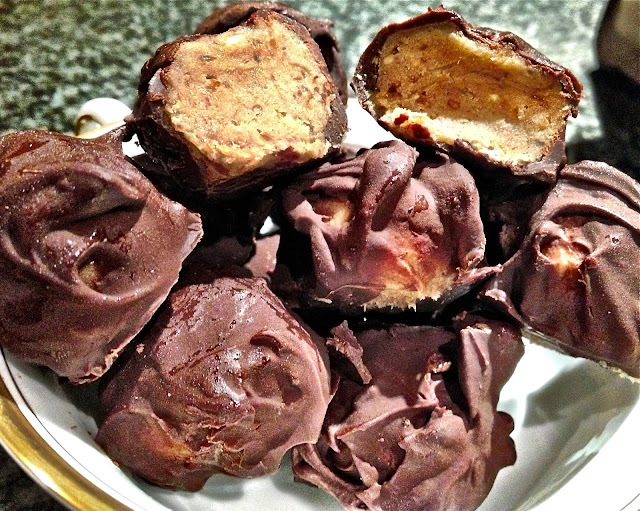 Coat each ball in the melted chocolate and freeze them until party time.